Ladiesfashionsense-Simple Christmas Tree Nail Art Design – Tutorial	Ladiesfashionsense-Simple Christmas Tree Nail Art Design – Tutorial! Looking for some fun nail inspo for your holiday party? Look no more. Rock around the Christmas tree with this fun grey , gold and green holiday mani jazzing up your finger tips! 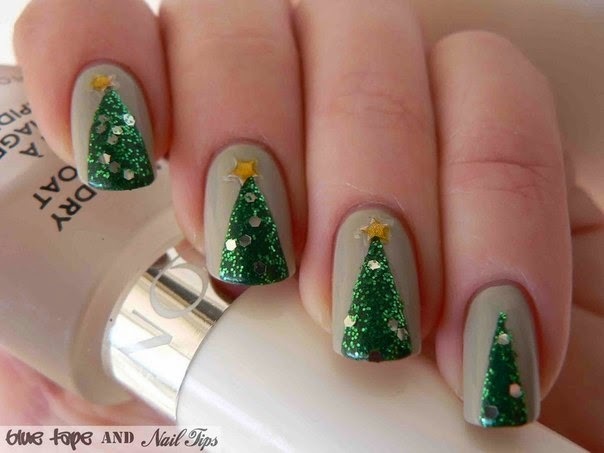 Here is a very simple Christmas tree nail art design inspired by BlueTapeAndNails. Directions: Apply nail base coat and after drying, use neutral nail polish as background for the green trees. Apply a quick-dry top coat on top. Now, start drawing the trees. Use two strips of tape to form a triangle on each nail and paint it with green nail polish. Remove the tape until complete drying to not destroy the design. Let dry totally. Prepare another two strips of tape for each nail and place them along the sides of the trees. Apply glitter top coat over the trees. At the end, add some stars to the top of the trees you have created, placing a drop of top coat on the tip of the tree before placing the jewel. Enjoy!